Sink More Putts is the game’s most effective, simple and least expensive practice aid for putting. Putting accounts for 43 to 50% of all shots. Most pressure putts are inside 10 feet. The best putters on tour are almost always among the top money winners. You can carry it in your bag and take it anywhere. 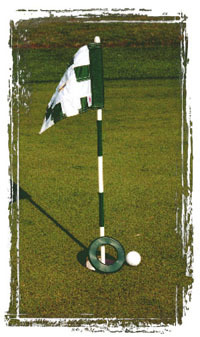 Use it to practice with or use it to warm-up before you play a round. To build confidence, shrink your target and make the hole seem large. Nothing helps you win your Saturday morning nassau more than good putting. This product is also available in the golf shops at both of our properties (Lake Doster and Wallinwood Springs). These prices are FOB at Manufacturer’s Dock. Product will be bulk packaged — 350 per box. Box size is 17 x 14 x 12. Above pricing does not include shipping or individual packaging. Manufacturer will store product for 60 days at no charge. Manufacturer will do individual packaging and stuff instructions in a plain poly package for $0.05 per unit additional.